I had a nice Mother's Day yesterday. I left the kids with their Daddy and then picked up my mom. First we went to IKEA. It was crazy!! We got a few things we needed and then went to lunch at Outback. After that we went to Tiny Stitches, a quilt store in Marietta. I almost got some fabric to make a baby quilt, but I chickened out. I've never made a quilt before! It's not that I don't have the time... it's the courage! I'm still thinking about it though because I know it would be so cute. I did get a couple fat quarters to make some stitching into a pocket or a needlebook or something?? Well, that's all that's been going on here. 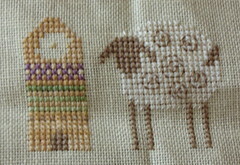 I plan to get the sheepie done tonight. I'll post a pic tonight or tomorrow! I really like the work on your stitch projects. Where I live in Phoenix, Walmart has a baby quilt kit in their crafts section. 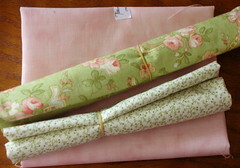 Everything you would need for a baby quilt, ?$20.00. Maybe they will have it in your Walmart too. Feel free to visit my blog.